Current Status: in Grand Lodge Vault; merged with Star in the East-Paskamansett Lodge to form Star in the East Lodge, 06/12/2004. For subsequent Past Masters, see Star in the East. At the end of World War II there were five Masonic Lodges working in New Bedford. The oldest, Star in the East, had been instituted in 1823; Quittacus, the youngest, in 1921. At the close of the war there was no indication that New Bedford was about to witness the birth of a sixth Masonic Lodge. Early in 1949, the Masons of New Bedford began to hear a rumor that efforts were about to be made to obtain a charter for a new Masonic Lodge. This rumor was not unfounded. The man behind the rumor was our late Brother Lewis S. Jones, a member of Hammatt Lodge of East Boston and a resident of New Bedford. Brother Jones felt both a need and opportunity for a sixth Lodge in New Bedford. Convincing others that such a need and opportunity existed was not easy, and Brother Jones' proposals at first ran into resistance. However, on July 11, 1949, he assembled fifteen dedicated Masons at his home. These men were convinced that not only was there a need for another Lodge in New Bedford, but that such a Lodge could render a real service to the Masonic Community. They discussed ways and means of bringing such a Lodge into existence. Worshipful John W. Heap, of Star in the East Lodge, was elected Temporary Master. A petition was prepared to be presented to the Most Worshipful Grand Master asking that a dispensation be granted for the institution of a new Lodge. Every brother present signed the petition. The name "WAMSUTTA" was the inspiration of Worshipful Charles R. Dugdale, of George H. Taber Lodge. "Wamsutta", an Indian name meaning "Loving Heart", is a name long associated with New Bedford. For over a hundred years the Wamsutta Mills was one of New Bedford's prominent industries, and the name Wamsutta had been used locally to designate other business establishments, clubs and even a telephone exchange. The original Wamsutta was an Indian Chief whose tribe occupied an area which now includes New Bedford. His father was Massasoit, the Chief who had welcomed the Pilgrims when they first came ashore at Plymouth Rock. King Philip was Wamsutta's younger brother. True to his name, Wamsutta, like his father, was a peaceful Indian. He would have fit in well as a member of our craft, for admonishing his people "to regard the whole human species as one family," he lived and taught the Masonic principle of Brotherhood. During his life-time an atmosphere of harmony and cooperation prevailed between Colonist and Indian, and a spirit of "true friendship (existed) among those who might otherwise have remained at a perpetual distance". All present agreed that Wamsutta was indeed a fitting name for a Masonic Lodge. Pursuant to the decision to invite other interested Masons to join in the petition to the Grand Lodge, the nucleus of fifteen grew to include the fifty-four Charter Members of Wamsutta Lodge. This increase was accomplished largely through the efforts of Brothers Jones, Heap and others. The list of Charter Members contained the names of many distinguished Masons. Seven of the charter members were Past Masters of their Mother Lodges, two of whom had served Grand Lodge as District Deputy Grand Masters. Two of the charter members were currently serving as officers of their Mother Lodges, and both subsequently became Worshipful Master of these Lodges. Of the fifty-four charter members, forty-three were members of Lodges in the immediate area. Twelve came from the Star in the East Lodge, eleven from Eureka, six from Quittacus, six from George H. Taber, four from Paskamansett, one from Abraham H. Howland, Jr., one from Pythagorean, one from Narrangansett, and one from Mt. Hope. The Mother Lodges of the other charter members were scattered up and down the Atlantic Coast. Approaches were made to the Grand Lodge by Brothers Jones, Heap and Allan L. Rawcliffe, who was to become the First Secretary of the new Lodge, and finally on September 17, 1949, the petition bearing the names of the Charter Members was presented to the Grand Master of Masons in Massachusetts, Most Worshipful Roger Keith. The Grand Master agreed that there was both need and potential for a new Lodge in New Bedford. He granted a Dispensation, and after two subsequent meetings at the home of Brother Heap, Wamsutta Lodge was prepared to begin its Masonic existence. On October 19, 1949, sixty-eight Masons, forty-nine of them Charter Members, gathered together in Doric Hall, Masonic Temple, New Bedford. The occasion — the birth of New Bedford's sixth Masonic Lodge. Acting by authority of the Grand Master, the instituting ceremonies were conducted by Right Worshipful Hiram A. Linfield, District Deputy Grand Master for the 30th Fall River Masonic District, the district to which Wamsutta Lodge had been assigned. The year under dispensation passed quickly. Wamsutta enjoyed a prosperous year under the leadership of its first Master, Worshipful John W. Heap. Attendance at meetings was high. Visitors discovered that a warm welcome always awaited them at Wamsutta, and the Lodge demonstrated that it had both the capacity and desire to continue as a full-fledged Masonic Lodge. The ancient and colorful ceremonies of constitution had never before been conducted in the present Masonic Temple. The most recent previous constituting had been that of Quittacus Lodge, almost thirty years before. The present lodge rooms, at that time, had not yet been built. The first Master, Brother Heap, served in Wamsutta's East for two years. He was succeeded by Worshipful Carl V. Doberck, of George H. Taber Lodge, who also served for two years. These two men did much to mould the character which the Lodge was to assume in the years ahead. Twenty-three brothers have followed Brothers Heap and Doberck into the East of Wamsutta Lodge. Their leadership added to the enthusiasm of the Brethren, has enabled the Lodge to grow and prosper and make friends. In addition to our Past Masters, many Brethren have made outstanding contributions to the Lodge. It is impractical in a short history to record them all, but it might be well to acknowledge the services of a few. The original Senior and Junior Wardens, Worshipful Brothers Ronald C. Smith and Charles R. Dugdale, were made Honorary Past Masters of the Lodge in recognition of their Services. Brother Allan L. Rawcliffe's valuable services as Secretary began before the Lodge was instituted and continued for over three years afterward. Brother Rawcliffe was succeeded by Brother Maurice B. Hanna, our first Marshal, who served ten years until his death in 1964. He was succeeded by Brother Heap who served until succeeded by Brother Dr. Myer Halpren in 1973. Brother Charles Stanley, the original Treasurer, was succeeded by Brother Myron D. Marder. Brother Marder served faithfully for eight years and has been followed by Brethren who performed their duties with honor and integrity. Brother Burton A. Hughes, our First Senior Deacon, was also our Ritual Coach during the year under dispensation. Brother Thomas J. Taft had advanced through the chairs as far as Junior Warden before he was called from New Bedford. These Brethren and many who are not named have participated in the writing of a record of Masonic achievement of which every member can be proud. Several Masonic honors have been bestowed on various members of Wamsutta Lodge. In 1961 at the 100th Anniversary of Pythagorean Lodge, his Mother Lodge, Right Worshipful Joseph Dawes was presented the Joseph Warren Medal for Distinguished Service. In 1965 at Cleveland, Ohio, Wor. Alvin L. K. Tunstall was made a Thirty-third Degree Mason. Right Worshipful Jacob S. Levine was appointed by Most Worshipful Laurence E. Eaton as District Deputy in 1961 and 1962, and Right Worshipful David Dratch, our present District Deputy, was appointed by Most Worshipful Donald W. Vose in 1973 and 1974. During our first twenty-live years many distinguished Masons have visited Wamsutta Lodge. Brother Keith, of course, presided at the constitution of the Lodge. Among those who accompanied him on that occasion were two future Grand Masters, Most Worshipful Whitfield W. Johnson, the Grand Marshal, and Most Worshipful Donald W. Vose, our current Grand Master, who was then serving as Junior Grand Steward. Subsequently, at our Fifth and Tenth Anniversaries Brother Keith delivered the principal addresses. Brother Keith was succeeded as Grand Master by Most Worshipful Thomas S. Roy, and Brother Roy was received into Wamsutta Lodge on April 18, 1951 for the purpose of installing Wor. Carl V. Doberck as Worshipful Master. Brother Roy was accompanied, among others, by the Grand Marshal, Most Worshipful Herbert H. Jaynes, another future Grand Master. In 1954, Brother Roy delivered the sermon at the Annual Wamsutta Brotherhood Seryjce at Tifereth Israel Synagogue. Another good friend of Wamsutta Lodge is Most Worshipful Thomas A. Booth, who is a frequent visitor. Shortly after his installation as Grand Master, Brother Booth was received into Wamsutta Lodge for the purpose of attending the installation of Right Worshipful David Dratch as Master. Thus Wamsutta was one of the first Lodges in the Commonwealth to receive Brother Booth as Grand Master. Two of the most outstanding events of the Masonic year have been the annual observance of Brotherhood Services at Tifereth Israel Synagogue and Brotherhood Night at the Lodge. Most Worshipful Brother Roy was one of the many outstanding Masons who were guest speakers at Brotherhood Services. 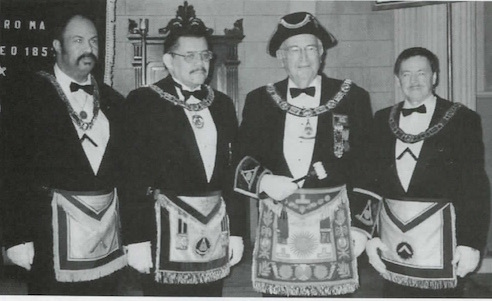 It was Wamsutta Lodge that conceived the idea of observing Brotherhood Night at the Lodge by having a Degree Team of Masonic Clergymen confer the Master Mason's Degree. It was an inspiration to see the enthusiasm with which the Clergy responded and the perfection with which they performed the Degree. Pictured above with M. W. David W. Lovering and M. W. Edgar R. McLean, are the officers of Wamsutta Lodge and Union Lodge No. 4. Wor. John W. Offley, III, Master, Union Lodge; M. W. Edgar R. McLean, Grand Master; M. W. David W. Lovering, Grand Master; and Wor. August R. Cote, Master, Wamsutta Lodge. 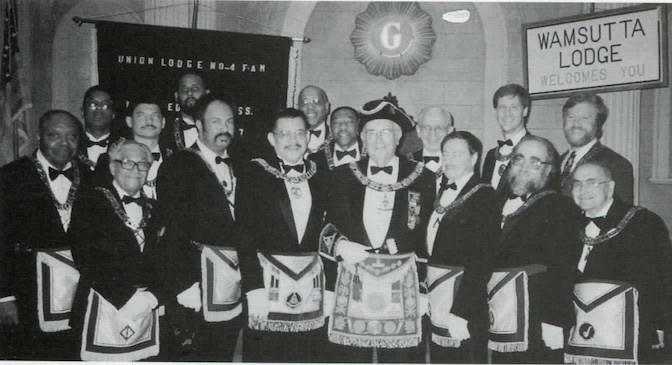 On Tuesday, May 30, 1995, Brotherly Love prevailed at the first joint meeting of the Grand Lodge of Masons in Massachusetts and the Prince Hall Grand Lodge of Massachusetts held in New Bedford. This historic Brotherhood Night was was held in the Masonic Building and was sponsored by Wamsutta Lodge, Grand Lodge of Massachusetts; and Union Lodge No. 4, Prince Hall Grand Lodge. A fellowship hour was followed by a catered dinner. The Worshipful Master of Wamsutta Lodge, Wor. August R. Cote received Wor. John W. Offley, III, Master of Union Lodge No. 4, and his officers. M. W. David W. Lovering, Grand Master and M. W. Edgar R. McLean, Grand Master, Prince Hall, were received into the Lodge with an enthusiastic standing ovation. Accompanied by a Suite of 40 distinguished Brethren, M.W. Bro. Lovering spoke of the meeting as a lesson in toleration and Brotherly Love and set aside the use of "Free and Accepted" for the evening. "We are all Masons." He again reminded the Brethren that "One man can make a difference, and that man is you." M. W. Bro. Edgar R. McLean, Grand Master, Prince Hall Grand Lodge, remarked "How good and how pleasant it is for Brethren to dwell together in unity." He spoke about the good we can do working together for the betterment of mankind. Several of the officers of both Grand Lodges spoke on the theme of the historic significance of the evening, the fact that coming together proves that we are all Masons, and that our good works are shown by "what we do, not what we say." Also present at the meeting were: R. W. Robert H. Hartley, D. G. M.; R. W. Arthur E. Johnson, S. G. W.; M. W. David B. Richardson, P. G. M.; R. W. Robert C. Patey, Grand Secretary; R. W. Harold L. Gerard. Jr., D. D. G. M., New Bedford 30th District; R. W. E. Joel Peterson, Grand Marshal; and several permanent members of the Grand Lodge. Also, from the Prince Hall Grand Lodge were: R. W. John Maddox, Jr., D. G. M.; John G. Bynoe, S. G. W.; Walter R. Butler, III, J. G. W.; M. W. Lloyd B. Miller, P. G. M.; M. W. Patrick E. Knight, P. G. M.; M. W. Chester R. Isles, P. G. M.; M. W. Nicholas B. Locker, P. G. M.; R. W. Joseph B. Snowden, Grand Secretary; R. W. Ernest Goodman, D. D. G. M. 4th District; and R. W. Frank Robinson, Grand Lecturer; and Wor. Wilbur Evans, Grand Marshal. Special thanks to R. W. Jacob S. Levine, P. D. D. G. M., and R. W. Charles E. Katsanos, P. D. D. G. M., for the extra effort they made in planning this event. This page was last modified on 13 September 2016, at 16:14.